This will be a short course. Just follow the steps below, and before you know it, you will be hooked. If you enjoy what they have to offer, please peruse their entire catalog. If this band is not to your liking, the terrorists have already won. Step One: Mentally reconcile the photo and song below. It’s really hard to write about a band that doesn’t talk about itself. Of course there are more detailed histories out there…but that’s not the point. What you should know is that these fine Canadians are absolutely amazing musicians. I mean really, really good. Those familiar and unfamiliar with the agile power and dynamics would agree that this is a unique band, and perhaps for some an acquired taste. Frankly, in my estimation, NOMEANSNO have eschewed the mainstream more successfully than any band of their caliber has a right to. You can try and delve deep figuring out their motivations, but if you find any answers, they probably won’t be what you are looking for. 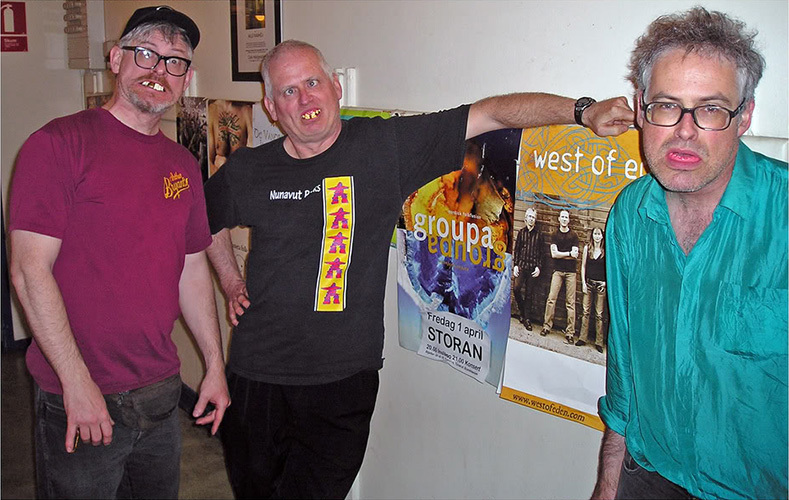 It all boils down to NOMEANSNO is a band that takes their music seriously, while hardly taking themselves seriously at all. There are no standard record label PR department sanctioned publicity photos of them looking wistfully off into the distance, or glaring into the camera. Their pictures do not grace their album covers (or even the album backs). They’ve made no promotional music videos. Their only interviews are found in punk zines, odd ball tv shows, or rare chats with what I assume are the French. Yet, for over thirty years, NOMEANSNO have been dedicated to cranking out some of the most wicked, acerbic, humorous punk out there. I will leave it to others to give you a more detailed history of NOMEANSNO. You can check out the entertaining “Official” NOMEANSNO website. You can read their Wikipedia page. My favorite biography is here. On each album page their will be a link to buy their music. Show them some love. Step Two: Listen to the songs below. Step Three: Watch these videos. If everything has gone according to plan, you are now a NOMEANSNO fan. If you so choose, you may move onto step four, and get your officially sanctioned NOMEANSNO tattoo. Congratulations, you’re a winner!